You are here: Home / All / Beliefs / Self-empowerment: are you at Cause or at Effect? As human beings, we tend to see the world in terms of cause and effect equations. If something we do consistently gets a certain result, we say that our action causes that result. If one event is consistently followed by another, we start believing that the first event causes the second. This is a useful way of looking at things when applied to simple relationships between inanimate objects: you kick a football, and that causes it to fly into the back of the net. An engineer who knows the mass of the football, the speed and angle at which you kick it, and the windspeed, could pretty much predict exactly where the ball is going to end up. This is called ‘determinism’: if you know the initial conditions, you can predict exactly what’s going to happen next. It all happens like clockwork. This deterministic world view is not so useful when applied to living things: if you kick a gorilla, what’s the gorilla going to do? The answer is – whatever it wants to. It could ignore you and stay still, it could obligingly scoot along the ground and into the goalmouth; or, it could pick you up and throw you into the back of the net. There’s a lot going on in the gorilla’s internal processing between the initial event (your kick) and the end result. Determinism is even less useful when applied to human beings. If everything was determined by what has happened previously, then free will would be an illusion, and our destinies would be predetermined by our situations, our upbringing, and our genes. We would definitely be placing ourselves at the ‘effect’ end of the equation. In contrast, when you move to the ‘cause’ side of the equation, you believe ‘I can make a difference; I can make things happen; I am responsible for how I feel and for where I am’. In answer to NLP co-founder Richard Bandler’s question of “Who’s driving the bus?”, you can say “I am!”. Putting yourself at cause is about taking responsibility – recognising that you have the ability, the ‘response ability’, to respond rather than just react to whatever life throws at you. You can make things happen; you have the power to change things; the ‘locus of control’, as psychologists call it, is within you rather than outside of you. When people think like this, they are accepting a belief that emotions are things which just happen to us, or that other people cause in us. So they act as if they have no responsibility for what they feel. Sometimes they even believe that other people are even responsible for what they do. I had a client once who wanted help with managing his anger. If another man looked at him in a certain way, he believed that he had no choice but to hit him – a belief that had landed him in court. So, people who place themselves at the ‘effect’ end of the equation, and from what I see this is most people, most of the time, are in effect saying “I am not responsible for what I feel or how I react; everyone else is.” They have given their power away. Somehow, those other people – or inanimate objects, in the case of cash machines that won’t pay out or outboard motors that won’t start – have caused the release of certain chemicals called neuropeptides within that person’s body which fit into the appropriate receptors in the surface of their brain cells and “cause” them to feel a certain way. That’s quite a degree of control, especially if it’s a lump of metal doing it. It gets stranger. When you’re at ‘effect’, you’re not responsible for your own emotions, but you are responsible for everyone else’s. That means you get to feel guilty whenever someone else says “You’ve really upset me!”. Since most people don’t like feeling guilty and will go to some lengths to avoid it, that means the other person has a way of manipulating you, just by saying that you’ve made them feel bad. We’ve all been there. A stimulus or trigger (whatever the other person, or object, did) is followed, apparently instantly, by the emotional response. This happens so quickly that it feels like one causes the other. Now actually, as Stephen Covey points out in his book “The 7 Habits of Highly Effective People”, there’s a lot going on between the stimulus and the response. The stimulus could be what that other person does, or something they say, or the tone of voice in which they say it, or the look on their face. In order for it to register as a stimulus at all, your mind has to interpret it as something threatening, provoking or guilt inducing, probably by matching it to the memories of previous bad experiences that it might remind you of. You have to evaluate the incoming sensory information in the light of your existing belief system. Maybe you have to tell yourself something about the stimulus that labels it as cheeky, insolent, aggressive, or inappropriate, before you get to feel the bad emotional response. All this happens at an unconscious level, in a fraction of a second – and the more times you do it, the quicker it happens. Like anything else, you get better with practice – your brain forms new neural pathways which are widened and strengthened with every repetition, so the message to set off the response can whip along them faster and faster. You’re not consciously aware of this process. As a result, it really does feel like the stimulus is causing the next thing you’re aware of – the unresourceful emotional response. The psychologist Viktor Frankl was imprisoned in Auschwitz and other concentration camps for five years. In that situation he saw the worst of humanity in the behaviour of the guards. Many of his fellow prisoners gave up, or acted as if they had abandoned all human feeling in the struggle to survive, as we would expect in such a terrible predicament. Following on from that idea, Stephen Covey says “Quality of life depends on what happens in the space between stimulus and response”. 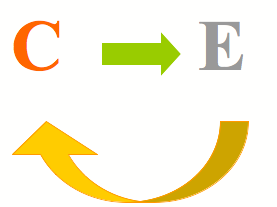 What NLP will give you is some practical ways to choose what happens between stimulus and response – and the more you exercise and develop that choice, the more your freedom to choose increases, and the more you move over to the cause side of the equation. The other thing that’s worth noticing about cause and effect is this: when someone is at the effect end of the equation, it makes them less effective at dealing with the curveballs that life occasionally throws at us. If someone says or does something unpleasant to a person at ‘effect’, the questions that person asks to make sense of what’s happened are probably going to start with “Why?” “Why are they being so horrible to me? Why does this always happen to me?” The question “why” focuses their attention towards the past; if you believe that where you are now is caused entirely by external forces, your upbringing, and your genes, of course they are going to look for past causes in order to understand the problem. In contrast, when you move to the ‘cause’ side of the equation, you believe ‘I can make a difference; I can make things happen; I am responsible for how I feel and for where I am’. In answer to NLP co-founder Richard Bandler’s question of “Who’s driving the bus?”, you can say “I am”. Rather than focusing on the past, that’s over with and done, the questions you ask when you are at cause focus your attention on what’s happening now, where you can actually do something to make a difference, and on what you want to change in the future. They focus on solutions rather than the details of problems, and with any challenge except the very simplest ones, they are more helpful to get to where you want to be. Of course, I’m not suggesting that putting yourself at cause will make your life perfect; you will still encounter challenges along the way. But the more you are at cause, the more resourceful and effective you will be in meeting them. I guess, like most people who have discovered NLP and have given some thought to the notion that we can, as human beings, use the princilples of NLP to change the way we view things and as a result become more happy with ourselves, our lives and the decisions we make, believe that it makes perfect sense to do so. The notion of cause and effect as you have discussed above for example is also very cleverly presented by Sean Stevenson who promotes the idea of choosing to live ‘at cause’ as opposed to settling for living ‘at effect’ like the majority of people do. As mentioned earlier, these ideas intuitively make perfect sense when they are presented in this way because the proposition of taking control of your choices (whether it be to choose a healthy glass of water with a slice of lemon over a glass of iced coke or beer on a warm summer day, or to choose not to react in an emotionally charged way to an insulting comment made about us by a work colleague or spouse for example) is an attractive one. The idea of choice in these matters implies however that we are free to make these choices whenever these circumstances arise. And, whilst I am keen to adopt the principle of living at the causal end of the spectrum I struggle with trying to find some compatibility with the arguments presented by neuroscience which essentially advise that the notion of free will is and illusory concept. Sam Harris for example presents a compelling argument which suggests that free will, simply put, is an illusion because the mechanisms by which choices or decisions are made our out of our concious awareness and the choice is made essentially before we are aware of making that choice. You may well be familiar with Sam Harris’s work but if not his lecture on free will can be found on YouTube if you are interested. In addition there is much work around the idea of habit formation within both academic and advertising literature which I’m sure you are familiar with that suggests that once habits are formed structures in the brain essentially take over the automatic processing of habitual patterns of behaviour (I.e. Basal Ganglia) and essentially these processes are again outside of our conscious awareness. It would seem that instead of simply making the decision (for example) to exercise more, we need to pay attention to the cues in our environment which kick start the process of an exercise habit and then provide an appropriate reward after carrying out this pattern of behaviour for this new behaviour to stick.. I realise that I’ve presented some very basic and brief information above to highlight the sense of incompatibility I feel with the notion of cause and effect presented in NLP circles but would welcome your and anyone else’s thoughts on this with a view to gaing some sense of clarity in these seemingly incompatible notions of choice and free will. Thanks Kevin! The ‘free will vs. determinism’ debate has been going on for ever. People do make plans, and those plans do have results in practice. Even if the plans and decisions were predetermined by forces outside our awareness, the results that we subjectively want would not have happened unless we went through the process of making decisions and planning. See also ‘nudge’ efforts to change behaviour by appealing to habit and psychological shortcuts, rather than to reason. Thanks for this response. I’m aware of Jonathan Haidt’s elephant and rider metaphor and find this a particularly useful way of relating to how powerful our ‘unconscious’ mind can actually be. Also, I understand the principles of nudge in terms of appeal to habit and realise the usefulness of this too; thanks for the reminder. I think the issue I am struggling with is in trying to reconcile the idea that if most of what we do on a daily basis is done on an unconscious or automated level and, if what we are about to think next occurs to us at conscious level only after our unconscious processes have kicked in (i.e. the decision essentially has been made before we become aware of it) then where is the choice in anything we decide to do? When for example, we decide to use the principles of NLP or habit research, or research from nudge efforts, to change our behavioural responses to specific situations or create new habits, who is actually making those decisions? If we interpret mind to essentially be an epiphenomenon i.e.understand that to have a mind we must have a brain and it is not something separate from our body, and if that brain essentially produces ‘mind stuff’ due to it’s chemical and biological make up intertwined with the our life experiences then what exactly does it mean to have the ‘free will’ to make certain decisions in life? Don’t get me wrong I understand the value of planning and goal setting and recognise the value in living at the causal end of the spectrum. 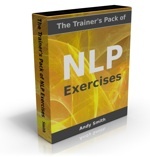 In addition, I can see how using the principles of NLP can help individuals overcome specific life challenges and lead more fulfilling and happy lives but the essence of my confusion I think lies in the understanding of choice. Do we really have a choice when it comes to making the right choices in life or do we just stand a better chance of making the right choice if we open ourselves up to or become aware of alternative possibilities and hope that the biological make up of our brain can handle these choices. The brain of a psychopath for example would not ever be capable processing emotion in the same way as a ‘regular’ brain and as such would not be open to the same ‘nudge’ principles relating to altering people’s behaviour where the resultant behaviour relied on tugging at emotional heart strings. In addition, whilst we may consider that the actions of a serial killer whose behaviour has resulted as a consequence of a brain tumor can be understood to some extent and should be treated differently from the actions of a serial killer with a healthy brain, it could be argued that the ‘healthy brain serial killer’ is just an extreme case of brain manipulation caused by life circumstances, and if you or I were to trade places with this unfortunate individual we would not be capable of acting any differently. Essentially, what I’m suggesting is that we may not actually be capable of determining what we are going to do next but everything we do may simply be as a consequence of what we have experienced previously along with the inherent capability and functionality of the brain we own. In your response to my initial query you explained that “…People do make plans, and those plans do have results in practice. Even if the plans and decisions were predetermined by forces outside our awareness, the results that we subjectively want would not have happened unless we went through the process of making decisions and planning”. In a nutshell then, my query is, what is it that informs us on a conscious level of the things we ‘subjectively want’ in order for us to begin the process of making decisions and planning and if the process of making decisions and planning are predetermined by forces outside of our awareness how can we say we have a choice in these matters? P.S. I don’t mean to be pedantic about this – I just find the issue fascinating. From an ‘interior individual’ perspective, it clearly makes sense to say we have a choice. It’s when we start looking at how to define ‘we’ or ‘I’ that things start to get really interesting. I haven’t come across Ken Wilber’s quadrant idea so thanks for this, I’ll read with interest. In terms of reflection though, I would ask again, do we really have a choice over what are going to reflect on? Are our reflective capabilities not limited by the boundries of previous experience? I think the notion of ‘I’ in terms of a separate sense of self has pretty much been demonstrated to to be a false notion and is essentially a useful fabrication by our own minds which allows a sort of knitting together of disparate events in our lives to provide a sense of continuity though out the life cycle. Thanks for taking the time to respond to my queries. Best regards and please keep up the great work. Fantastic job on the podcast too by the way.